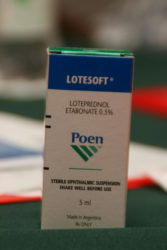 The Woodlands Hospital’s Opthalmology Department is now the exclusive provider of Poen eye drops used to treat glaucoma. The Poen products were described as being a high quality, reasonably priced and readily available. At the hospital on Wednesday, Dr. Shailendra Sugrim, Glaucoma Specialist and Consultant Ophthalmologist gave detailed information as it related to the types of glaucoma, how to recognise them, the various tests that are done and the different types of medications that are used. Sunil Moonasar, representative of Poen in the Southern Caribbean and the Managing Director and Founder of Eye See You Ophthalmics & Medical Supplies Ltd Trinidad, also spoke on Poen and the product line. He stated that the product provides different types of remedies to treat glaucoma and preserve vision, while adding that it is distributed in Jamaica, The Bahamas, and Barbados, among other countries.